Over the past few decades, despite the ups and downs of the economy, the fitness industry in America has enjoyed dynamic growth. It’s a $24 billion industry that serves 51 million Americans of all ages and income levels. What’s amazing is it is forecast to grow an additional 23 percent over the next decade. What’s the secret of its growth? According to Ray Grayson, founder and CEO of Mr. Shut Up and Train, the industry has experienced continued growth because it is serving an important need and improving lives. Baby boomers are flooding gyms in record numbers to counteract the effects of aging, and the younger generation is using fitness centers to improve their health and combat weight gain. The unfortunate part is that we are a very unhealthy and overweight country. Due to our way of life and the statistics, there will be no shortage of Americans visiting the doctor or the gym in the future. The fitness industry is evolving in order to meet the challenge and needs of the market. The local one-off gym is becoming a thing of the past, replaced by national chains like LA Fitness. These enterprises outperform the competition through the use of high-tech equipment, state-of-the-art marketing programs that build brand awareness, and national and regional advertising campaigns. By standardizing their gyms, these fitness franchises have done what Starbucks has done. When you enter these gyms you are met with a recognizable brand. To further this initiative, many have painted their machines the same colors as their logos, made all the gyms look the same, so that the consumer will have a consistent experience no matter which location they visit. For example, LA Fitness has a national presence, and are all across New Jersey, Pennsylvania, Georgia, Texas, and California, where it began. Traditionally, most gyms business models depend on cost-per-square-foot, but innovative clubs focus on revenue per square foot, like retailers. How much can you make? An average regular gym can generate about $500,000 in net revenue in a year, while larger operations on average earn from $700,000 to $900,000 in annual net revenue. Of course, controlling costs is important. Many gyms make the mistake of doing too much, and offer classes that end up being unpopular and unprofitable. By trimming unprofitable programs such as aerobics classes, you can often deliver a quality gym experience for less than $20 a month. 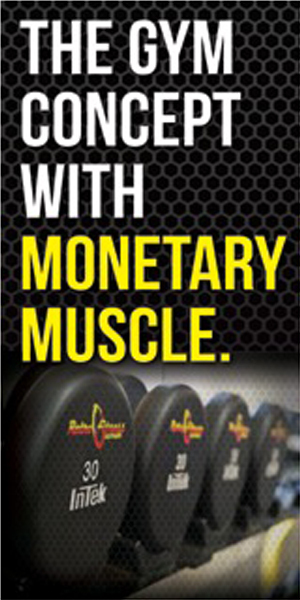 This gives your business an advantage over the other gyms that are charging $40 and $60 per month. Keeping membership fees affordable makes it more feasible to survive if the economy falters, as it did in 2008. We all have enough expenses, and since getting people to create a good habit is already hard enough, keeping the price palatable is a big factor in your fitness business’ success. At $19.95 a month, the membership fee is very attractive, and appeals to a wider demographic than some of the more expensive gyms. You also want to keep the environment bright, colorful, and clean. Obviously patrons are there for a great workout experience, so the gyms should be filled with top-grade exercise equipment. Some of the common workout equipment includes: computerized treadmills, elliptical machines, resistance machines, and of course free weights. If your patrons are new to fitness, or they have specific training goals, have personal trainers at every location that can help motivate and give them a plan to reach their goal. After workouts, members are exhausted, thirsty, and hungry. This is a great earning opportunity, if you enable them to be able to stop by your juice bar for rejuvenating protein shakes. Bottom line, customers want a great experience, a variety of good equipment, knowledgeable personal trainers and amenities that make for a great workout. To ensure your franchise builds a reliable membership base quickly and efficiently, you will need efficient marketing and advertising campaigns. Joining a fitness franchise often allows you to tap into their established multi-million dollar national ad, radio, and billboard campaign to build brand awareness and blanket local markets. Well established franchises takes it a step further, and their national marketing director works with franchisees to create a unique marketing calendar just for their market and target base. These types of resources are a lifeline of the business, and very attractive to a potential franchisee. While advertising is important, nothing ever takes the place of word of mouth from satisfied customers. By following the franchise’s system, keeping the workout facilities spotless, and encouraging referrals, fitness franchises can minimize their membership churn rate. Naturally, longer customer retention leads to a higher lifetime customer value. Membership price point, early intervention and adoption are some of the keys to keeping customers in place. However, at the end of the day, what matters to patrons are the little things: remembering your customer’s name, personalization like knowing which snack or drink they like from the juice bar, and ease of access to reach the club from their house. Everything must work well together, you can’t just depend on price or features of your facility alone. Potential franchisees are evaluated on their finances and skills as a businessperson. Quality franchises are in business to win and protect their brand integrity. This means, they says “no” more often than they say “yes” to franchise applicants. Their goal is to make sure applicants are a good fit for their company, every bit as much as applicants want to make sure that the fitness franchise is a good fit for them. Typically, fitness franchisees are on their second or third business venture, which is important for two reasons. These individuals generally have the net worth to get bank financing for their franchise, and equally as important, they have hands-on business experience. Fitness experience is not crucial, but knowing how to run a business is a major plus. If a franchisee needs training in accounting or bookkeeping, these are skills that can be acquired and often taught by the franchise; however, common sense is hard to teach. What makes a fitness franchisee successful? Like most other successful business owners, it’s having a combination of passion, aggressiveness, and open-mindedness. A major benefit of joining a franchise is that they have already made and fixed the costly mistakes so you won’t have to. At the end of the day, that is a franchises value and what franchising is all about. Regardless of whether it’s hamburgers, coffee, or fitness, choosing a reputable franchise is always an easier option than tackling that business on your own. For the amount of money you give away in royalties, it mitigates a lot of risk. Nothing can mitigate all your risks, but it mitigates much of the risk, giving you an excellent chance to succeed.